So, if you follow me on the twitter dot com, you may have noticed that I was a teeny bit happy to receive a copy of this. It was my first novel from Netgalley, and would be my 100th read of this year. This is the second novel in The Winternight Trilogy, the first being The Bear and the Nightingale. I loved BEAR so much that I created a new rating for it, and gave it 6 out of 5 stars. (See my review here). So I went into this desperately hoping that it would live up to my expectations. Oh my, it did not disappoint! GIRL picks up almost immediately following the end of BEAR. Vasya is no longer a child, but a grown woman. She has fled her town in fear after being labelled as a witch. Just her, and her loyal bestie Solovey (who happens to be a horse). 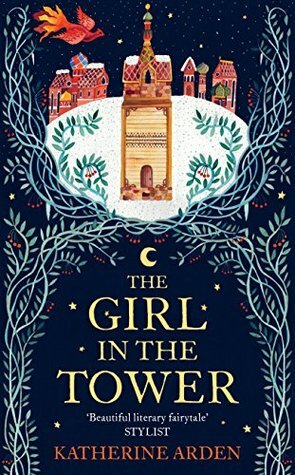 She spends time travelling in the cold, harsh winter of northern Rus’ before finding her way to Moscow. Vasya is having to hide her gender, going by the name Vasilii Petrovich (the masculine form of her real name Vasilisa Petrovna). When in Moscow Vasya discovers a threat to the Grand Prince and the city as a whole. With the (hesitant) support from her brother Sasha (who we first met in BEAR), she works to save the city, it’s Grand Prince and it’s citizens. So, what did I like about this? Pretty much everything. I’m not even exaggerating. Done, end of review. OK, maybe a little more. GIRL has a more action/adventure feel than BEAR. There isn’t as much world-building as there was in BEAR, but it isn’t necessary – the world has already been established, and therefore this novel doesn’t feel like anything has been lost or is missing. The chyerti (Russian folklore spirits) continue to appear in the story. Morozko continues to play a major part. I loved Morozko even more this time. He is such a good character. He is an immortal and powerful god, but he is also vulnerable. He has flaws, and I loved that! We meet Marya, Vasya’s niece, and I fell in love almost immediately! I know, I am somewhat fickle, but she is so adorable. She is like a mini-Vasya. I swear to the gods, if we get a Marya/Vasya team up in the next novel, I will lose my mind! I will be completely unbearable! And I will make no apologies for it. YOU HAVE BEEN WARNED!! Katherine Arden continues to write with skill that I can not help but read with great admiration. I am sure that there is an immense amount of effort that goes into writing something so complex and yet having it feel so effortless. I highlighted so many passages (73 in total) that I felt showed a level of writing that I hope to achieve. 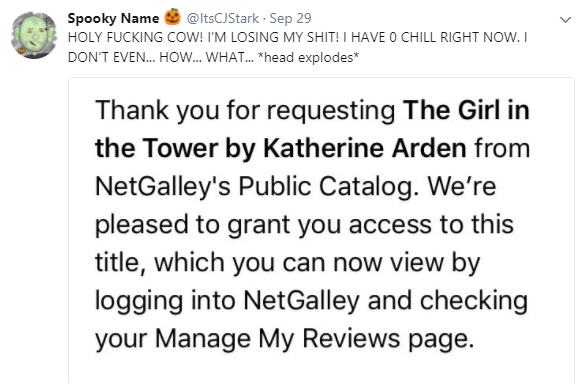 I tweeted this, but I will say it again, Katherine Arden inspires me to be a better writer. I have tried to find things that I don’t like about this in order to try and write a balanced review. But honestly, I am really struggling to come up with anything at all. The book can feel slow in parts, which may not be for everyone. We still didn’t get the death that I wanted from the first book, I am tempted to just kill them myself. ha ha ha ha peace and love! I suppose the first couple of parts could be referred to as a slow burn. But I love that. I love a story with great characters that I can connect with, a plot that keeps me engaged and a world that has my mind eye glancing around in wonder. That is what you get with both this novel and BEAR. I love books that stir my emotions. Whilst reading this (and BEAR) I would be laughing in one moment, crying the next, frustrated (with a character) the next, and bouncing around with excitement and anticipation the next. Isn’t that the ultimate goal of a good story?! They are literally the perfect book for me. Her tongue felt thick; the vibration of men’s deaths still rang through her body. There were no more lies left in her, and no more half-truths. If you like dark fantasy fairy tales inspired by folklore, do not hesitate to start this trilogy. Start with BEAR though, you need the world building and character establishing to get the full effect of GIRL. And if you have read BEAR and liked it, then do not hesitate to pick up this book. You will not be disappointed. I wouldn’t normally consider a book to be in my top 5 all time faves without having reread it a couple of times and continued to enjoy it – but it would be a safe bet that this trilogy is probably going to be there soon (if not secretly already). I went to sleep smiling after reading this, and woke up still smiling. Anyway, I’m off to carve wooden animal figures. Peace and Love. Seeing how much you love these books and having heard good things from others as well, I think I have to treat myself in the coming months…Will be a bit of a wait until the next book, I guess? Haha, Solovey does mean nightingale. This story is full of little things like that which I appreciated. Yea, probably some wait. BEAR came out in Jan 2017 (I think). GIRL comes out on 5th Dec and then we it’ll probably be end of 2018 at the earliest for the next book *sobs*. I think I read recently, maybe on twitter, that the author said she’s currently writing it.